Two Mumbai gallery operators have been arrested in connection with a scheme to swap a temple idol in India with a fake. MUMBAI, INDIA – Indian authorities arrested a father and son Tuesday accused of smuggling and dealing in stolen Indian cultural artifacts for more than a decade. The arrests are the result of an ongoing investigation under the auspices of Operation Hidden Idol. U.S. Immigration and Customs Enforcement’s (ICE) Homeland Security Investigations (HSI) special agents from the HSI New York and the attaché Office in New Delhi assisted police officers from Tamil Nadu’s Economic Crime Division’s Idol Wing (Idol Wing) in making the arrest. Vallabh Prakash, 86, and his son Aditya Prakash, 47, both were arrested at their homes in Mumbai, India. Each is being charged by Indian authorities with smuggling idols stolen from temples in India. Originally from Nepal, the Prakash family settled in Mumbai in 1959. The Tamil Nadu’s Economic Crime Division’s Idol Wing requested the assistance of HSI New York’s cultural property unit to help identify some of the individuals responsible for supplying major stolen works to Subhash Kappor of Art of the Past in New York. HSI special agents also assisted in identify who had stolen and smuggled the recently repatriated religious stone idol of Ardhanari (an androgynous deity composed of Shiva and his consort Shakthi). The idol had been documented at the Siva Temple, Sri Vriddhachalesvara, Vriddhachalam, South Arcot, Tamil Nadu India as far back as 1958 by the French Institute of Pondicherry. HSI has determined that the piece had been stolen sometime around 2002 and replaced with a modern forgery. The theft went undetected until HSI’s Operation Hidden Idol brought attention to Kapoor’s alleged misdeeds at which time dealers, collector’s, religious worshippers and museums began to reexamine their idol collections. Almost three years ago, a police report was first filed identifying that the Ardhanari had been stolen. HSI special agents were able to identify the smugglers of the Ardhanari to be the Prakashs, a family that owns and operates Indo-Nepal Art Centre, a gallery in Mumbai. In 2002, the Prakashs offered the stolen Ardhanari to Kapoor at Art of the Past and he purchased it and together they had it smuggled to the United States. Kapoor proceeded to sell the idol with false paperwork to the Art Gallery of New South Wales in 2004. After identifying this theft and then many others attributed to this network, HSI special agents worked with Tamil Nadu authorities to arrest Dean Dayal, and nine of his cohorts in Chennai earlier this year. Dean Dayal appears to have been the mastermind on the ground behind the actual thefts at the temples, while the Prakashs, appear to have been the “brokers” or the individuals who would sell the stolen idols wholesale and then smuggle them out of India. The arrests of Aditya and Valab Prakash is something authorities had been working toward together for close to two years. This is one of the first U.S. based cultural property investigations where via partnering up with foreign law enforcement the investigators have been able to arrest the thieves, brokers/smugglers, dealers/sellers, and those who were providing false provenances to disguise the pieces. And the investigation is still ongoing. As part of the their examination, HSI agents went on to identify dozens upon dozens of additional illegal artifacts stolen, sold and trafficked by Indo-Nepal Art Centre over the past twenty years. These articles include a Pratyangira (Hindu Goddess associated with Shakti) and a pair of Dwara Palas (door guardians) All three idols were stolen, sold and smuggled via the Prakash’s to Kapoor in 2002 and all three pieces were subsequently sold to the National Gallery of Australia were they are still on display. HSI has recovered numerous illicit idols linked directly to this part of the vast transnational criminal organization have been traced to major museums and collectors both in the United States and around the world. 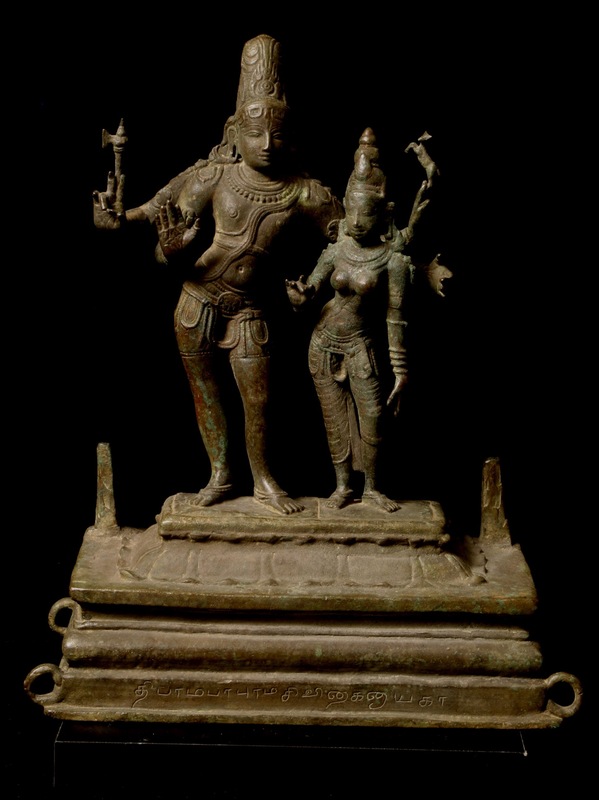 On July 1, 2015, an anonymous collector of Asian antiquities voluntarily surrendered a stolen 11-12th century Chola bronze representing Saint Manikkavichavakar, looted from the Sivan Temple in Sripuranthan Village in Ariyalur District, Tamil Nadu in India. The Idol Wing has also recovered an incredibly important, yet previously unidentified Shiva Nataraja. HSI special agents have been able to establish that this piece can be directly linked to the network identified here. This Shiva Nataraja idol had previously been stolen, cut, smuggled by the Prakashs to Kapoor in New York City where he had been trying to sell it for $2,500,000.00, or for the “special price of $2,000,000.00”. Besides these arrests and the arrest of Kapoor who is currently in jail in India, HSI is working in conjunction with the Manhattan District Attorney’s office, and has arrested and obtained guilty pleas from Kapoor’s sister, girlfriend and former business manager. As a result of Operation Hidden Idol, HSI has executed over twenty warrants and seized over 2,500 artifacts worth over $100 million. These artifacts have been sourced from countries all around the world. Some of these seized artifacts can be directly attributed to those involved in today’s enforcement activity like a stone Murugan stolen from Thachur a village in Tamil Nadu. 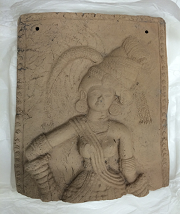 HSI’s Operation Hidden Idol focuses on the activities of a former New York-based art dealer, Kapoor, who is currently in custody in India awaiting trial for allegedly looting tens of millions of dollars’ worth of rare antiquities from several nations. The trails of looted artifacts have been traced all around the world. Within the past three months two domestic museums including Ball State University, the Honolulu Museum and Peabody Essex, partnered with HSI to surrender illicit cultural property stemming from Kapoor. Over the last four years, HSI special agents have executed a series of search warrants targeting Kapoor’s Manhattan gallery, along with warehouses and storage facilities linked to the dealer. 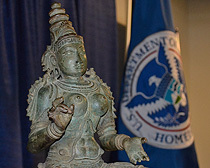 NEW YORK – Agents with U.S. Immigration and Customs Enforcement’s (ICE) Homeland Security Investigations (HSI), with assistance from U.S. Customs and Border Protection (CBP), seized a 14th century A.D. bronze Parvati statue and four bronze Tamil Nadu figures, estimated as a group to be worth more than $5 million. These statues were seized as part of an HSI Cultural Property, Art and Antiquities Program investigation titled “Operation Hidden Idol.” The seizure is a direct result of international cooperation with the government of India, Interpol and the Manhattan District Attorney’s Office. HSI special agents seized the Parvati at the Port of Newark, with the assistance of CBP, for violations of Inadmissible Goods, Stolen Property statutes. 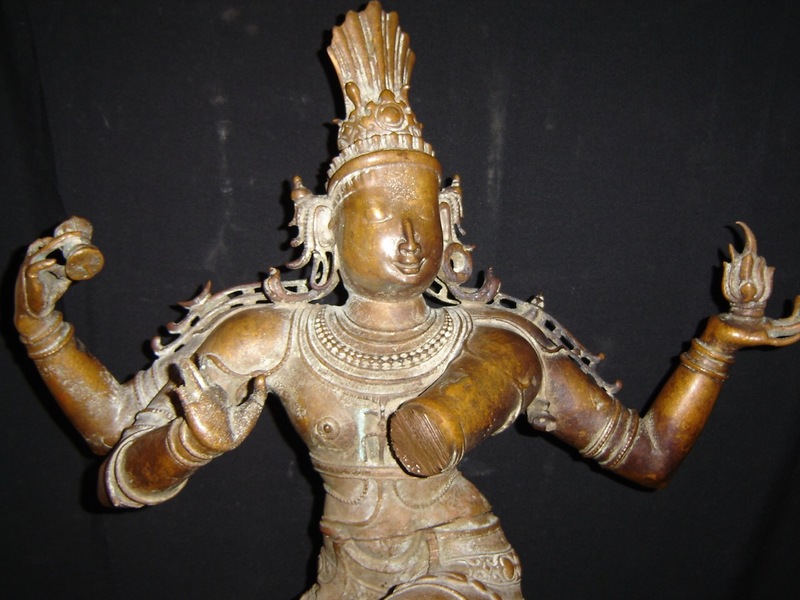 This sculpture is the cultural property of India and is one of many items stolen from temples in the Tamil Nadu region and allegedly sold by Subhash Kapoor. 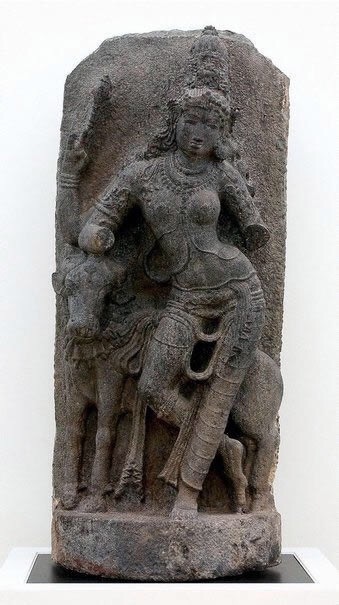 Even though the statue had been placed on the Interpol Stolen Works of Art Database, the Parvati had passed through the hands of six different dealers and been given multiple layers of false provenance over the past six years. The statue had been in Europe and had been aggressively pursued along each step of its journey by HSI New York. This is the fifth bronze Chola statue allegedly stolen and sold by Kapoor that has been recovered by HSI in the past year. The Parvati is considered the goddess of love and devotion, and is an important Hindu deity. In this depiction she sits on a large lotus throne, her raised right hand originally holding a water lily, a symbol of grace and beauty. A 2nd century B.C. 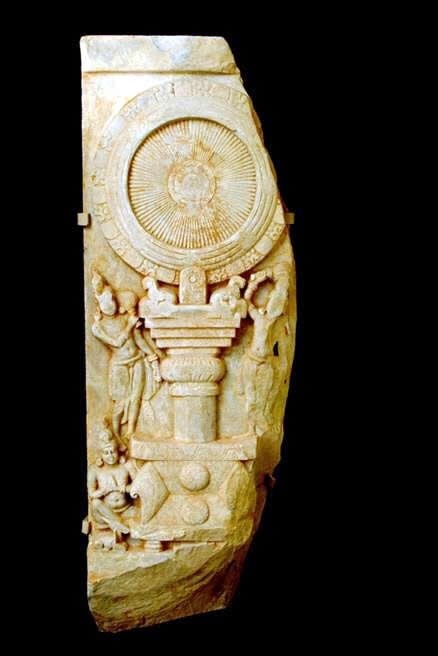 Bharhut Stupa Yaksi pillar sculpture valued at nearly $18 million. This investigation has uncovered that Kapoor allegedly created false provenances to disguise the histories of his illicit antiquities. Investigators urge collectors and museums to further scrutinize their collections and contact HSI with any additional information. Kapoor, who was the subject of an Interpol Red Notice, was arrested in late 2011 at Frankfurt International Airport in Germany. On July 14, Kapoor was extradited to India, where he faced criminal charges.